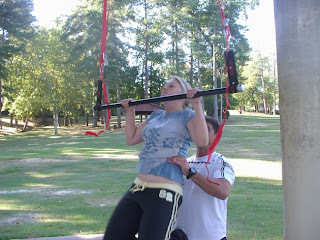 The Again Faster Bar is a portable pull-up bar. Like many other quality training devices, it was invented out of necessity--I needed to do pullups outdoors, and had no good way to make it happen. After a visit to the hardware store and some serious hands-on testing, I had a piece of equipment that allows you to do pull-ups off of nearly any horizontal span: trees, signs, rafters, basketball hoops, etcetera. Set-up only takes a few minutes, and break-down is just as quick. The AF Bar can even hang off non-level surfaces, as each of the attachment points is independently adjustable. Rated at over 400 pounds, it's as solid as a rock. "...Awesome! The Bar felt amazing in my hands, was easy to set-up and I hit a solid 25 chins with a 40lb weight vest!...Great product Jon! Exactly what I was looking for. The no-brainer was who I was buying it from." After seeing his video, I was inspired to do some testing of my own, and I grabbed a few members of the Again Faster crew to help me out. Unfortunately, I only managed 16 chins with the 40-pound vest, but the Bar held fast through every rep.
Never satisfied, I decided to push the envelope a little bit. I strapped the AF Bar over a forty-foot cliff and kipped out a bunch of pull-ups. The fine folks at Crossfit.com helped me get the word out. To see the "Cliff Kipping" Video, click here. Since its inception in October, we've sent Again Faster Bars all over the country. John Velandra of Designs in Fitness purchased one for his North Carolina athletes, using it for pull-ups and the occasional Turkish Get-up. Again Faster has taken the pull-up bar and made it accessible to athletes everywhere. You don't need to rely on the local gym or a shoddy doorway mounted bar any more. For $75.00 we'll send the AF Bar anywhere in the Continential United States, and you'll have it in a fraction of the time it takes other vendors. When you purchase equipment from Again Faster, rest assured that we stand behind it 100%. Your bomb-proof pull-up bar is guaranteed for life. If you have any questions about ordering, please shoot me an email. I'm happy to help. Please Note: We've moved! You can now order the Again Faster Bar through our new website! Click here to order. Hawaii and Alaska orders: We require an additional $15.00 fee to ship to your locations. This charge covers our additional shipping costs. You will receive an invoice via Google Checkout for $15.00 if you place an order from Hawaii or Alaska. Please contact me before ordering the $150.00 version. The Again Faster Bar with Chains is only available in Metro Boston. 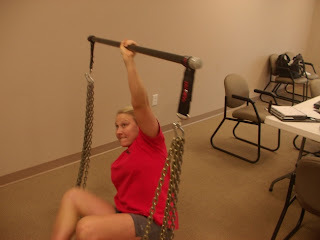 We believe that elite fitness can be achieved with no equipment whatsoever. Your own bodyweight is a powerful tool, and we encourage you to use it creatively. You can develop tremendous strength and power using only your natural environment and your imagination. Nonetheless, we've developed equipment that has great versatility and applicability across a wide range of fitness pursuits. Some of our equipment is novel, but more often than not, we've borrowed our concepts from others. We offer this equipment because it is efficient and cost-effective. Again Faster Equipment will allow you to train smarter, and it won't consume a lot of your hard-earned cash. We use it ourselves, and we know it works. When you buy from us, you buy our honor-bound guarantee. We build rugged, durable equipment that has been tested strong. If you break it, rest assured that we'll make you happy. You won't find any machines at Again Faster Equipment. There is no "on" button on any of our stuff. No training aid is ever a substitute for hard work, and any that claims to be is either illegal, bullsh*t, or both. Thanks for checking out Again Faster equipment. We're confident you'll love it.